On several occasions, I’ve used Garmin products and they’ve always been user friendly and reliable. So when the chance arose to try out one of their sport watches, I was intrigued, though mind you, I am not an athletic person at all. At most, I take a zumba class once a week, but other than that, it’s just daily walks to and from the public transportation to the HighEnd Teen office and back. For the sports inclined like me, Garmin is synonymous with GPS devices, but perhaps you athletes out there have known that Garmin watches make excellent sport partners. The Garmin Vivoactive 3 comes in a very exclusive and simple box which includes the charger cable, a manual book and the guarantee sheet. The watch itself is average sized, though it feels a bit empowering for me as I am used to dainty women’s watches on my wrist. For a watch that’s focused on sports, it is pleasantly sleek and stylish, especially with that luxe bezel. It is surprisingly light and the silicone straps are very comfortable—none of that sticky plastic feel that I was disdained from rubber-based watch bands. 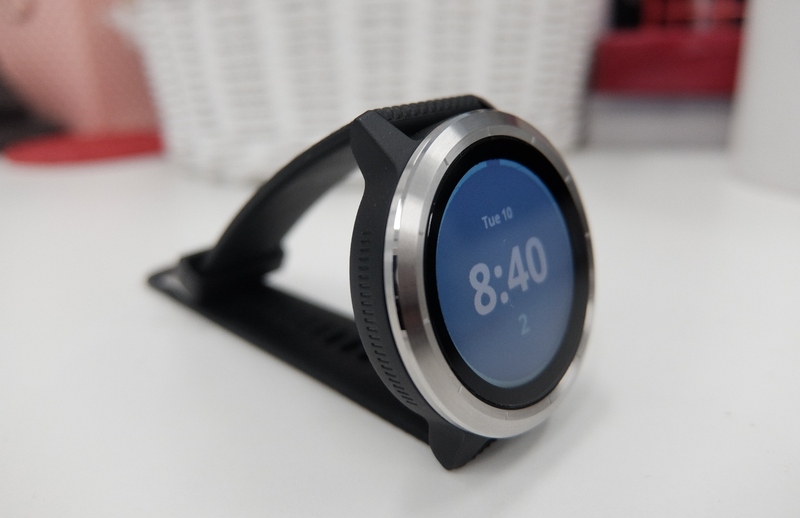 The watch features a touch screen which you can scroll through the options in the watch.You can also scroll by nudging the ridges on the side below the bezel. The batteries are incredible. The watch, when used for normal tracking that I’ve been doing, lasted about 6 days for one time charge. But I’ve been told it lasts less when used for more intense sport tracking. When you’re roughing it out, there’s no need to worry because the watch is protected by Gorilla Glass, and it is also water resistant. One of the awesome features on this watch is how you can change the watch face and its orientation. No matter if you’re a lefty or a righty, you can toggle the orientation so that the side button is either on the left or on the right of the watch, whatever you prefer. So I put on the watch after I get ready, and keep it on until the moment I lay down to rest. (The Garmin representative I talked to suggested to wear it even in my sleep for a more comprehensive tracking.) For daily tracking, I wanted to see how many steps I was taking per day, and how many calories I was burning. The watch also takes note of your stress levels throughout the day, which I thought was pretty cool. To see your comprehensive tracking report, you must download the Garmin Connect app. There you can see your data for the details mentioned above, as well as preloaded tracking for specific activities that you can do, such as running, cycling, swimming, walking, yoga, and more. You can also track your sleep, weight, and Vo2 Max. From the approximately one week of using it, I found out that on most days, I fulfilled the suggested steps for the day. On the first day of using the watch, it suggested 5000 steps, and it increased a little bit more the next day. While I was wearing the watch, I noticed that I enjoyed seeing the numbers go up while I take my water breaks, praying breaks, toilet breaks and stopping by officemates’ cubicles at work, instead of staying put more in front of the computer. I simply enjoyed walking more and felt a sense of accomplishment every time I received a badge for my walks. From all the daily walking I did, I burned down approximately 500 calories per day that week, which, if the goal is to lose weight, is far below the requirements of calories burned (obviously! 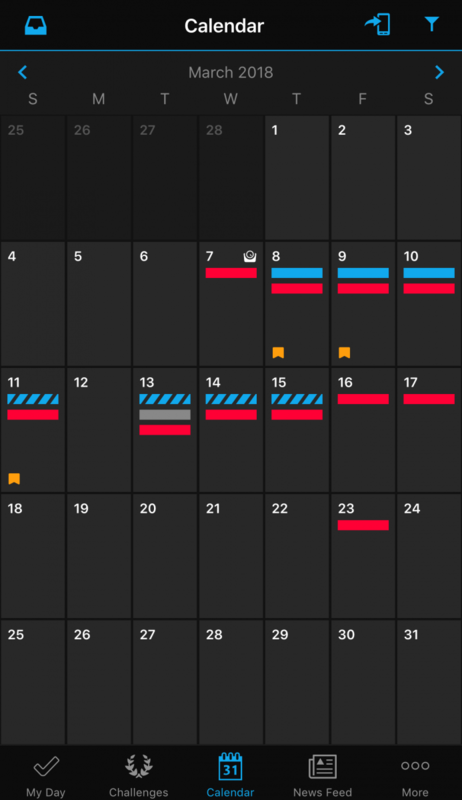 ), but seems pretty okay for a sedentary week. According to livestrong.com, a pound of fat corresponds to roughly 3,500 calories, so losing a kilogram of weight per week means cutting 7,700 calories from your diet each week – or 1,100 each day. During that week, my average resting heart rate for resting is 62 while my average high is 117. According to medicalnewstoday.com, the normal resting heart rate for adults over the age of 10 years, including older adults, is between 60 and 100 beats per minute (bpm). Highly trained athletes may have a resting heart rate below 60 bpm, sometimes reaching 40 bpm. So I think I’m pretty normal here. As for my stress levels—here’s where I found the most surprising fact about myself—is that I’m on medium stress a LOT of the time during the day. During the approximately one week of wearing the watch, my average stress level is 48. 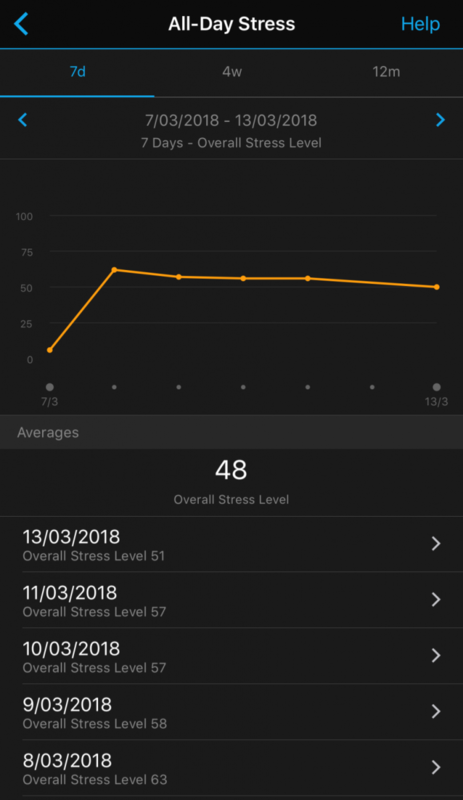 On one of the days, I spent almost 3 hours on medium stress and almost 2 hours on high stress from a total of about 6,5 hours of wearing the watch during that day. 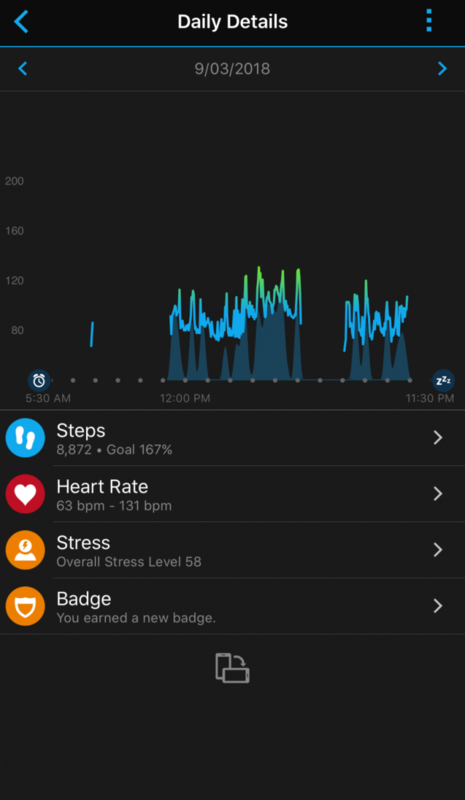 Thank goodness for this feature from Garmin Vivoactive 3 for the stress-relief. It asks you ‘Take a moment to relax?’, in which it guides you on a short breathing exercise to soothe down your nerves. I found myself using this multiple times over the course of using the watch. All in all, this sleek smartwatch is extremely useful for daily tracking of steps, calories, heartbeat and stress levels. You may not realize how high your stress levels can be, and this watch may help with managing and calming down to avoid burnouts or breakdowns. I found that taking short breathing exercises with the watch helped immensely, and still continue to do so to this day. While I often achieve the target amount of steps (and wearing this watch highly motivates me to walk more), I do need to step up on my sports activities if I want to maintain my fitness and health. I did not partake any sports during the duration of my watch testing, but the optimal use of this watch is when used to keep tabs for multisports such running, cycling, swimming, walking, yoga. The watch is already preloaded with the settings for tracking down your statistics for your workouts, for an all-around fitness report. The app is easy to use with simple user interface. 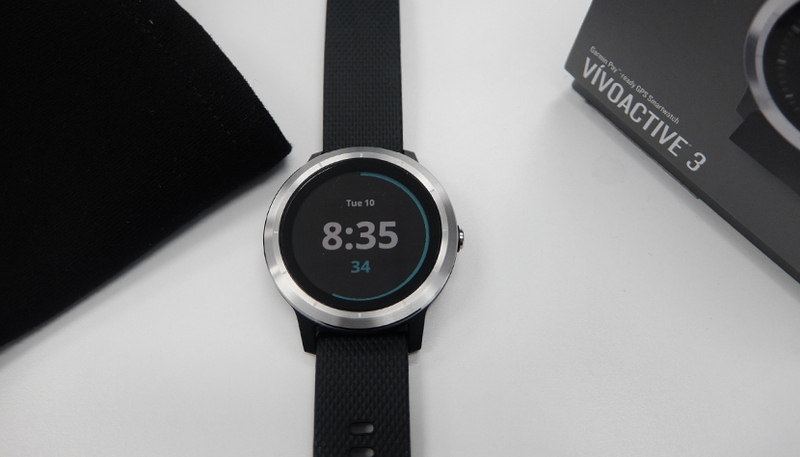 This watch is perfect for active individuals as a great way to track your fitness, and for active wannabes like me it’s a great motivation to achieve better and better in fitness and sports. Disclaimer: I am neither a health nor an electronics expert. Please consult the professionals for detailed and precise information on health and fitness, as well as proper use of this gadget. The views and opinions expressed in this article are those of the authors and do not necessarily reflect those of the company.